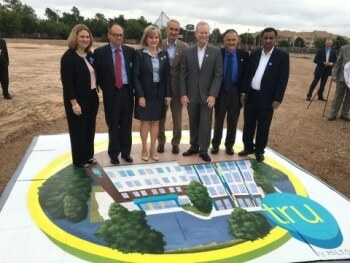 On Friday, less than four months after Tru by Hilton’s public debut, Hilton Worldwide broke ground on the brand’s second property, located in Oklahoma City. The celebratory event, in keeping with Tru’s forward-thinking and innovative personality, swapped out hard hats and shovels for 3D artwork of the hotel’s exterior design, which allowed attendees to feel as though they were part of the hotel. Oklahoma Governor Mary Fallin addressed the crowd and Oklahoma City Mayor Mick Cornett and local Councilman Larry McAtee also attended Friday’s event. The 86-room Tru by Hilton Oklahoma City Airport is located just five miles from the Will Rogers World Airport at 802 South Meridian Avenue, and is expected to open in spring of 2017. The new property is expected to add 75 construction jobs and 20 jobs in the long term once the hotel is open. The value proposition continues to drive developer interest. Hilton Worldwide currently has 70 approvals and 172 more deals committed or in progress, up from 130 hotels in January when the brand launched at The Americas Lodging Investment Summit. Tru by Hilton is believed to be the fastest growing new-build hotel brand in U.S. history. When completed, the new Tru by Hilton Oklahoma City will provide guests with smart and efficiently designed guest rooms and reimagined public spaces, including an open lobby with four zones for lounging, working, eating or playing. Designed to appeal cross-generationally, complimentary amenities will include a unique toppings bar breakfast, coffee and tea; mobile check-in and Digital Key available through the Hilton HHonors mobile app; a multifunctional fitness center; and segment-leading Wi-Fi bandwidth. Tru by Hilton Oklahoma City will participate in Hilton HHonors®, the award-winning loyalty program serving more than 50 million members. Hilton HHonors offers members exclusive benefits and more ways to redeem points than any other guest loyalty program. More information about Tru by Hilton can be found at www.trubyhilton.com. Media may access high- resolution renderings and more by visiting news.hiltonworldwide.com/trubyhilton. You can also follow Tru by Hilton on LinkedIn by visiting https://www.linkedin.com/company/tru-by-hilton.